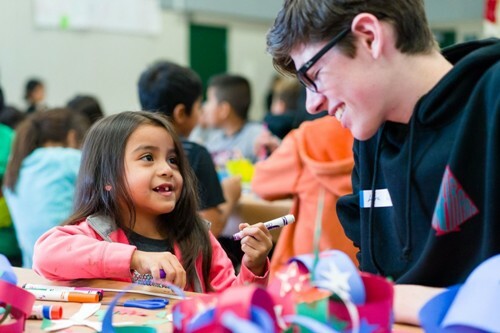 Sunday Friends is a day-long program on Sundays that takes place in a healthy, warm, productive, and mutually supportive community setting: elementary schools. Very low-income families take part in activities that include hands-on learning, creating gifts for those in hospitals/nursing homes, preparing and serving healthy meals, and more. They attend classes on financial/English literacy, parenting effectiveness, health/nutrition, etc. Through their participation, families earn “tickets” (currency at Sunday Friends), which can be redeemed for essential goods! Don’t you love being able to earn what you get, being in charge of your own “money”? Sunday Friends allows underserved families to do just that, giving them a unique opportunity to build self-respect and pride in their own accomplishments. Everyone can earn through work and helping others, not just by accepting handouts. I believe having the opportunity to take control of your life, to achieve something and be proud of it, has an enormous impact on those who are struggling. As kids, we struggle with many seemingly big​ things in life, from getting good grades to making friends at school. How do you feel when you take even just a small step in the right direction, like getting a best score on a quiz or sitting with the new kid at lunch? Let’s ask Janis Baron some questions regarding her work with Sunday Friends and the impact she feels it’s had. Maybe you’ll get some tips on how to empower those around you! Amazing Kids (AK): Explain your vision in launching Sunday Friends. What impression do you hope to leave on the lives of others? Janis Baron (JB): I want children from impoverished families to know that they have gifts to give the world and can pursue a path that will allow them to be who they are meant to be. I want parents to know that, even if their own education and financial resources have been limited, they can play a pivotal role in helping their children break the generational cycle of low education and poverty. I want volunteers and families to know that we are all one community, with no real boundaries, and we can all work together side-by-side with mutual respect to uplift us all. AK: Could you share how your program is set up? How does Sunday Friends give families the skills to take control of their lives? JB: We make it possible for parents, children, and volunteers to all work together on Sundays to learn academic and practical life skills while giving back to the community at large. We instill developmental assets into children and teach parent engagement to the parents. As parents and children engage in the educational and service activities in partnership with the volunteers, they earn tickets redeemable for basic necessities, like toiletries, school supplies, and diapers, as well as toys, sports equipment, and clothes. AK: What are the activities that allow family members to earn the tickets? JB: Some examples are making gifts for children in hospitals; preparing and serving healthy food to everyone; writing thank you letters to program contributors; attending classes and consultations engaging in hands-on science, math, and other learning projects; completing take-home assignments; participating in classes on topics of parenting effectiveness, path to college, school readiness and success, health, nutrition, financial literacy, legal issues, violence prevention, computer skills, and English as a second language; and much more. AK: Sunday Friends is a unique model, in which charity is not given but earned. In what ways is such a model beneficial among underserved families? JB: To begin with, no one wants to feel like a charity case. That just makes you want to complain or learn how to work the system. What people want is to be of value and to have opportunities to earn what they need. Sunday Friends makes that possible. Through Sunday Friends, parents are able to teach their children to give their best, earn, and make thoughtful spending decisions, skills that will serve them throughout life. Another benefit of our model is this: When parents have a way to earn basic necessities, the overwhelming, daily survival stress lessens, which allows them to turn more attention to their children’s healthy development and school success. AK: Describe the challenges you face in helping others through a nonprofit organization. How do you involve donors and volunteers who wish to contribute to your mission? JB: The greatest challenge is always funding. Every nonprofit struggles to raise the funds needed. Many of Sunday Friends’ donors become dedicated to us because they are moved by the handwritten thank you letters they receive from our family members. In fact, our families write about 6,000 meaningful letters every month, which also fosters a family culture of writing together. When it comes to volunteers, the way to promote volunteerism is to make the volunteering experience meaningful. Come volunteer in a Sunday Friends program, and you’ll see why we draw in many volunteers. AK: In what ways has the program changed over time? How do you adapt to meet the needs of new families? JB: The evolution of our program over the past 20 years has been profound. We have steadily increased the variety of ways participants can give back to the community and the areas and modes of learning. We have also added one-on-one consultations and advocacy to help families address difficult situations and crises in their lives. All of the additions are prompted by a) feedback from our families and b) partnerships with other community organizations. AK: Perhaps your greatest act of service is your effort to honor the stories of individuals working to reach financial stability. Whose story has most resonated with you? When we first met Andy, he was 12 years old, living with his disabled mother in a homeless shelter where we held our programs prior to moving to Lowell School. But shelter rules called for them to move after five months. Their next “home” was the living room of a relative. helping others by working on the Treasure Chest team…skating to our programs on the rollerblades he had earned through his participation in Sunday Friends. When Andy was 14, we moved to our current location, a distance too far for a boy to travel alone. By 16, Andy had learned to take buses and was looking for a job to pay for his fare as well as food and other necessities. He applied at Sunday Friends, and because of his prior experience, work ethic, and enthusiasm, we hired him to be a part-time Treasure Chest Manager. It has been our joy to see Andy grow in responsibility, reliability, and self-confidence throughout the two years since then. Today, he leads program equipment setup, facilitates Treasure Chest “shopping,” and fully participates in our program committee meetings. The Sunday Friends community is supporting his efforts to plan for his future, including college, financial aid, employment, budgeting, and independent living. Andy’s challenges have not dampened his enthusiasm or his dreams. Through it all, his ability to care for himself and others has grown. We couldn’t be prouder of Andy. He is attending community college while working nearly full-time. His friends from Sunday Friends continue to be there to listen to his news, teach him how to drive, help him fill out his tax forms, socialize, etc. He joins us as a Sunday Friends volunteer whenever the program does not conflict with his work schedule, and he fills in as a paid staff member when we need a substitute. Andy continues to bubble over with excitement about all that he is learning and everything he plans to accomplish in his life. AK: What advice would you give to students who want to help others help themselves? JB: Start by discovering what is in you to give. What is your special gift to humanity? Find this not in your mind but in your heart. Then, as you identify the people you will work with, uncover the deepest place where you respect them, want the best for them, believe in them. Start with sincere respect, so your gifts will be received. Finally, honor the gifts that your recipients have to give back to you. AK: How can everyday kids apply the values your program teaches to their lives? JB: Commit to seeing the best in each person with whom you interact. Speak to that part of them. Base your relationship with them on that place of goodness that you recognize. In this way, you will uplift everyone. AK: What does giving back mean to you? How do you measure your success? JB: Our participating families give back to the community, so they will be vital, contributing members of society instead of society’s needy victims. Everyone prefers that over charity. It is the gateway to a positive future. The success of Sunday Friends is measured through a) the levels of participation of both families and volunteers, b) our Professionally Measured Results​, and c) the sentiments families express through their essays (many available upon request). research team from a local university to conduct a survey-based evaluation of the program and its results. AK: Who is someone who has made a difference in your charitable efforts? How did that individual change your efforts, and in what way were you changed? JB: Every single family member has influenced the development of our program. They have taught us how to break down the barriers among communities and how to combine love with respect with opportunity. Thank you so much, Janis Baron, for sharing your Sunday Friends journey with the ​Amazing Kids! Magazine​. I hope everyone is now inspired and empowered to go find a talent and forge a path of their own. I know I definitely am!